Hey everyone, I’ve consumed my 365th beer! It was… wait, I should probably save that for later, since I have a lot more beers to write about. Instead, I’ll start this off with my five favorite episodes from the new season of Mystery Science Theater 3000, now up on Netflix. Notes: A pale ale that has been lagered. It’s easy to drink, but with enough hoppiness to make it not boring. It went well with my dinner at Django. Notes: Also consumed at Django, this was richer and a little more flavorful thanks to the Belgian yeast. It paired well with my macaroni & cheese, but then everything pairs well with mac & cheese. Notes: The hops and the sour were an odd mix. It’s like they were competing for dominance on my tongue. Interesting, but not something I’ll drink again. Notes: A honey wheat, but the honey was subtle. 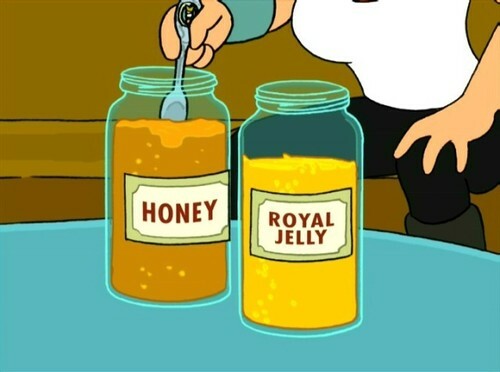 I know royal jelly is a real term, but I still kind of hope it’s a Futurama reference. Notes: A ginger beer, which made me think it wouldn’t be too strong. I was wrong. It’s way stronger than you would think while drinking it. Notes: I tend to think of Millstream as the most traditional of Iowa’s breweries, but this is a hazy IPA, unfiltered and very hoppy. Is it heaven? Eh, but it’s pretty good. Notes: A combination of Iowa beer and Iowa music, so I had to give it a try. It’s named after the Cedar Rapids instrumental surf band. It’s made with Simcoe, Columbus, Centennial, and Cascade hops, for a flavorful mix that lives up to the band. Notes: This had recently been added to the roster at Peace Tree’s Des Moines branch when I stopped in to celebrate blowing job interview (at least I assumed at the time, but I was right). I liked it. Notes: As this experiment started to wind down, I decided I needed to spend a little more time at the “chain” breweries out in West Des Moines. It’s fine beer, and it is brewed here, so I have no complaints. This one was kind of piney, but didn’t taste as strong as it actually is. Notes: A cask-aged IPA, OK, but not super memorable. Notes: A hefeweizen, very tasty. This would probably be my go-to choice for a return visit. Finally, the Galaxy Haze review! I’d been waiting to see what you’d say. That beer confused my mouth.